Look it are the ants from the movie A Bugs Life and they are waiting for you to color them in. Can you make this picture more animating and lively? Choose colors and paint this happy ants as you like! 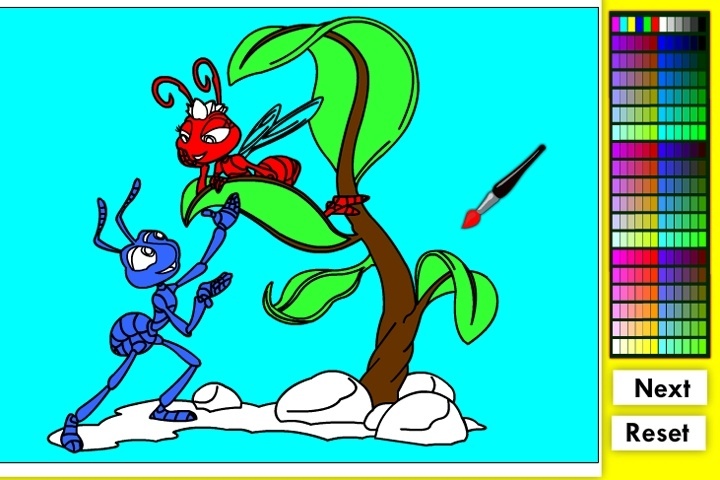 Use your mouse and pick the colors from the right side, then use your mouse to click in the picture to color the ants in this A Bugs Life Online Coloring Game. If you want to play A Bugs Life Online Coloring games online you have come to the right place! GamesLoon adds new A Bugs Life Online Coloring games every week. This is your game portal where you can find the biggest collection of free A Bugs Life Online Coloring games online. Do not forget to rate our A Bugs Life Online Coloring free online games while playing!